The Center for Safe & Healthy Children at HCMC and the University of Minnesota Masonic Children’s Hospital provides comprehensive medical evaluations for children and adolescents who are suspected victims of abuse and neglect. This joint multidisciplinary program shares a medical director and includes child abuse pediatric consultants, medical social workers, pediatric nurses, pediatricians and community professionals. The program works closely with the Sexual Assault Resource Service and CornerHouse Child Advocacy Center. Prevention of traumatic brain injury (TBI) is an essential component of care at Hennepin Healthcare. As one of only 42 Injury Free Coalition for Kids sites in the nation, and the only one in Minnesota, directors Dr. Andrew Kiragu, MD and Julie Philbrook, RN, MAN, MAL coordinate this injury prevention program based only at Level 1 Trauma Centers. ThinkFirst National Injury Prevention Foundation helps teach kids of all ages how to reduce their risk of injury and prevent TBI and spinal cord injury. The Minnesota Chapter “ThinkFirst of Hennepin County” is based here, started by neurosurgeon Dr. Tom Bergman, MD and Julie Philbrook, RN, MAN, MAL. Brain researcher and neurosurgeon Uzma Samadani, MD, PhD, FACS serves on the national Board of Directors. Food is Medicine. No one agrees with that more than those that care for growing bodies and minds! The Food Shelf at Hennepin addresses hunger and food insecurity among patients and families of which half of those are children. Taking Steps Together is a nutrition and healthy lifestyle education program for families who are living with or are concerned about childhood obesity. The Department of Pediatrics works with community programs to connect families to nutrition resources, such as cooking programs like Cooking Matters, WIC, and healthy lifestyle classes. Dietitians join other providers in caring for children from birth to age 18 years, focusing on the promotion of optimal infant, child, and adolescent nutritional health. They provide expertise in assessing for adequate growth, healthy weight, appropriate micro-nutrient intake, and in the management of feeding difficulties such as oral aversion and swallowing dysfunction, as well as providing recommendations for tube and intravenous nutrition when needed. Their involvement in the care of patients spans our active general and sub-specialty outpatient clinics, to general, PICU, NICU and burn inpatient units where dietitians participate in patient-centered rounds and serve as a resource for patients and staff. We have a deep commitment to diversity. Employees, patients, patient’s family members, volunteers and business partners are treated with fairness, dignity, and respect without regard to race, color, creed, religion, national origin, gender, sexual orientation, gender identity, disability, age, marital status or veteran status. Recognized by the Human Rights Campaign as a Leader in LGBT Healthcare Equality in the Healthcare Equality Index. Reach Out & Read: Hennepin has served as the state's unofficial Reach Out and Read incubator since 2005, contributing office space and facilities to the state's coalition of Reach Out and Read clinics. Partnering with medical providers to promote early literacy and school readiness in exam rooms nationwide, they give new books to children and advice to parents about the importance of reading aloud, which promotes reading, assists with school preparation and success with larger vocabularies and stronger language skills. Books for Babies: We deliver the book Peek-a-boo! to every baby born our Birth Center. The book is available in many languages, and we create customized, bilingual editions to ensure that we can welcome all our newborns with books in the language closest to their hearts. Sudden infant death syndrome (SIDS) is the leading cause of death among infants between one month and one year of age. We teach, practice, and model safe sleep for infants and their families. Learn more about safe sleep and the simple steps you can take at home to create a safe sleep environment for your baby and to reduce your baby's risk of SIDS. Hennepin Healthcare is the first and only hospital in Minnesota to be designated a Gold Safe Sleep Champion by Cribs for Kids, an organization that works to promote safe sleep and prevent SIDS deaths. We follow a Infant Safe Sleep and SIDS Prevention Policy to teach and model what safe sleep looks like campus-wide. An essential component of our mission is to improve health and wellness through teaching. 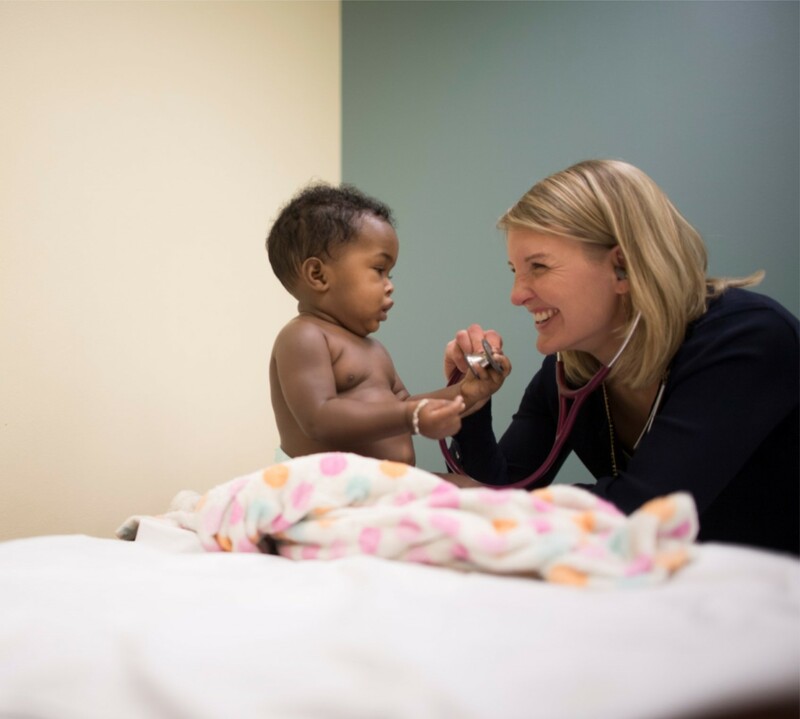 Each year the Hennepin Healthcare pediatric faculty teaches over 250 learners throughout the institution. This includes undergraduate students, medical students, advanced practice provider students, residents and sub-specialty fellows. The Office of Pediatric Research and Advocacy provides resources to support the research and child advocacy goals of the Pediatrics Department. The office staff includes personnel with a wide breadth of talents to assist in the numerous and varied aspects of research. Financial support of the program is provided by an allocation of general departmental funds and outside grant revenues. Departmental efforts are closely coordinated through the Hennepin Healthcare Research Institute (HHRI) which oversees all medical research that takes place at Hennepin Healthcare.